As they usually do on Saturdays, Pepa and her friend Cari have gone for a walk on the beach of Malvarrosa, one of the most popular landscapes of their beloved Valencia. Located on the shores of the Mediterranean, this Spanish port city of 790,000 inhabitants is known worldwide for its beaches and for being the origin of the famous "paella." But in recent days, Valencia has appeared in the media for a more serious issue: tomorrow, Sunday, June 16, its port will receive 629 undocumented migrants - mostly Africans - rescued by the "Aquarius" ship off the coast of Libya. The "Aquarius", a humanitarian ship managed by the NGO SOS Mediterranée and Doctors without Borders, was turned away by Italy and then by France. The new Spanish president, Pedro Sánchez, a Socialist, decided then to receive the ship. The fate of the Aquarius caused a diplomatic row between Italy and France, with French President Emmanuel Macron accusing Italy of "irresponsibility" for turning it away. "I wonder where they will disembark them," Pepa said, with her eyes fixed on the harbor's dockyards. The heat is strong and the two friends walk around the dock in swimsuits and flip-flops, with no intention of covering themselves until it's time to have lunch in a restaurant. Near where they are, local authorities and humanitarian NGOs are working on organizing the reception of the Aquarius and two other Italian ships, packed with immigrants that are dreaming to reach Europe at once. The arrival of the three vessels - loaded with a total of 629 undocumented migrants - mostly Africans rescued in front of the Libyan Sea while trying to cross the Mediterranean - has involved a deployment of 2,320 people, including around 1,000 volunteers from the Red Cross, 400 accompanying translators and 100 members of the regional Department of Public Health, as well as police and law enforcement agents. "This incident highlights the great human quality of this city. They say that providing health care for immigrants will be a priority, that additional doctors have been hired to meet their needs, volunteer platforms have been set up to welcome them into their homes ... People have turned to help," said Cari, a 62-year-old caregiver for elderly people. Her friend Pepa, already retired, nodded, and then added: "We all have to make an effort and understand where they come from." The Spanish government announced last week its decision to accept the arrival of the ship Aquarius after Italy and France decided to close its ports. The decision made by President Sánchez implies a more humanizing turn in the country's migration policy. However, it also reveals the inability of the European Union to achieve an efficient and coordinated solution to the migration crisis, which mainly affects the countries of the south: Greece, Italy, France and Spain. Every year, thousands of immigrants try to reach the ports of these countries by crossing the Mediterranean in rafts and precarious boats, controlled by mafias and people smugglers. There are also thousands who die in the sea while trying. So far, Italy, Greece and France have endured the pressure of the arrival of these immigrants to their shores. In the absence of a common European policy in this area, each European country can decide whether or not to close its ports. So, when the Italian government decided a week ago not to accept the Aquarius, and France did the same, amid a scuffle of accusations, the alarm was unleashed: "What to do with the 630 immigrants without papers navigating aimlessly aboard a humanitarian ship in the Mediterranean?" "I think it's really good that Spain welcomes these people. It forces us to be empathetic, to understand where migrants come from, since it is very easy to keep looking at the situation without doing anything when we have a full belly. Clearly, we have to provide them with immediate medical care, especially to the most vulnerable, that is women - there are seven pregnant women on board - and children," said Cari. "But we must not forget that in Spain there are also many people in need, people whose pensions are reduced, or who have to wait months to be treated in a public hospital and now see with astonishment that all these immigrants are going to receive immediate medical attention," her friend Pepa added. They have spent the whole Saturday morning talking about the issue. Then Pepa remarked: "Why do (politicians) not help everyone? I believe that part of the decision of receiving the Aquarius is political propaganda." Josep, a businessman form the outskirts of Valencia, shared Pepa's thoughts. On Saturday he was in Valencia to participate in "Desafío Bestcycling," a massive spinning event hosted at the port this weekend, coinciding with the arrival of Aquarius. "No, in my opinion, it does not seem right to welcome them. It is not fair that they get financial help or get a job because they accept lower salaries than a Spaniard. Call me a racist if you want," said Josep, still sweating after so much pedaling in the sun. Beside him is his friend Loren Boluda, organizer of Desafío Bestcycling, which this year attracted 1,200 participants, half of them from out of Valencia. 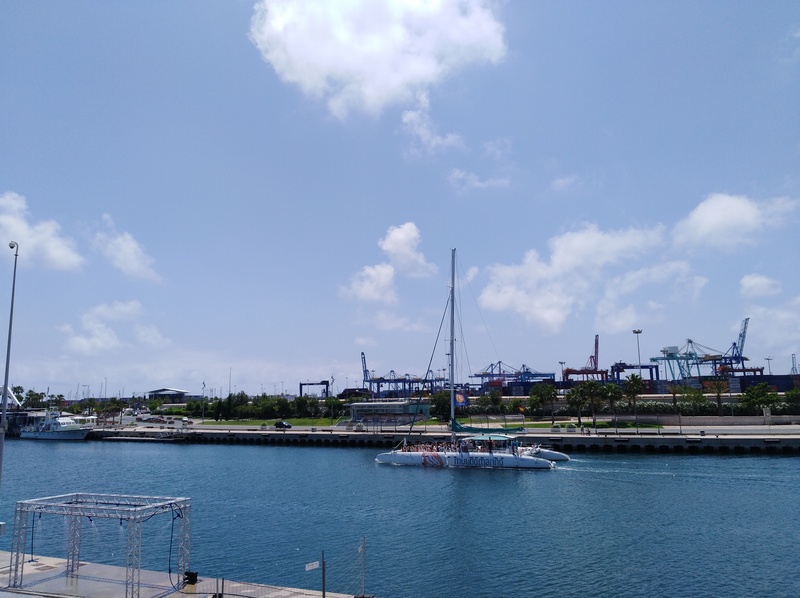 "Shortly after the start of the event, (the port authorities) came to ask us if we could turn the music down, as it bothered the press conference about the Aquarius next door," complained Boluda. 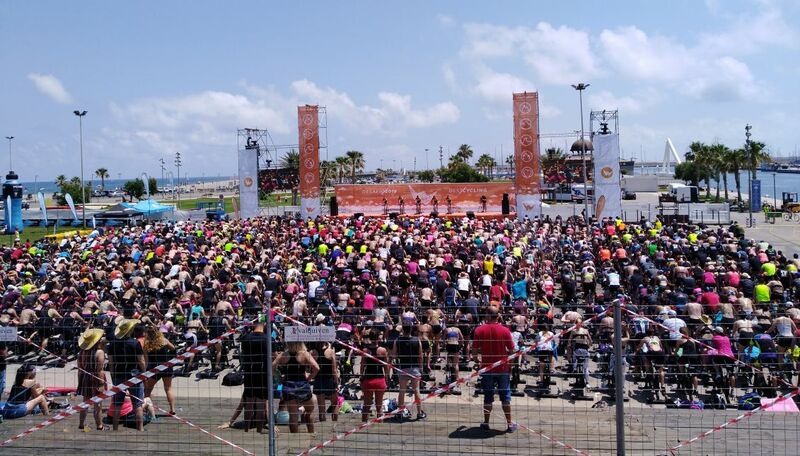 "Desafío Bestcycling attracts 1,200 people to the port and generates thousands of euros for the city, but politicians are only interested in the image," he added. Boluda is also skeptical about the Spanish government's decision to receive this 629 migrants in Valencia. "Ok, it's true that we have a high quality of life here, but there are also many families who do not have enough money to pay for their children's meals at school, or who do not manage to survive on pensions... And, who helps them?" Far from the techno music of the cyclists, two teenagers looking pretty much in love walked slowly through the streets of El Cabanyal, an old fishing district, with low houses painted in colors and gardens full of flowers. "I think it's great that Valencia welcomes these immigrants. In school we've been discussing this topic. It was time to do it," said the girl, a 16-year-old Valencian, with a fair complexion and curly brown hair. Her boyfriend is black. He is Nigerian, and arrived in Valencia following his father a year ago. They met in class. "The Aquarius immigrants do not have papers and many will have problems finding a job and being able to stay in Spain. In fact, is the same problem that happens to me," said the Nigerian boy, who didn't want to say his name either. He explained that he has both Nigerian and American passports (he has family in California), but that he should renounce to one in order to obtain a Spanish passport. Even so, it is a very complicated bureaucratic process. "I think I'll have to go back to the United States," he said. The future of the 620 undocumented immigrants who will be landing Sunday in Valencia is still unclear. The Spanish government has announced that initially the immigrants aboard the Aquarius will not enter the so-called Immigration Detention Centers (CIE), as is usually the case with immigrants arriving in small boats from the African coast, but - given the special situation of their arrival - they will be distributed in humanitarian aid centers, depending on the conditions in which they arrive. With regard to the 123 children who travel alone, the priority will be to welcome them and only repatriate them when it is concluded that the best thing for the child is to take him with their family, as reported by El País. The Spanish Immigration Law prohibits detention of children. "The people of this city have realized that we all need to help, Valencia is the most human city in the Mediterranean," insisted Pepa, changing Spanish for Valencian, the local language. "The problem is: what will happen to them later?"